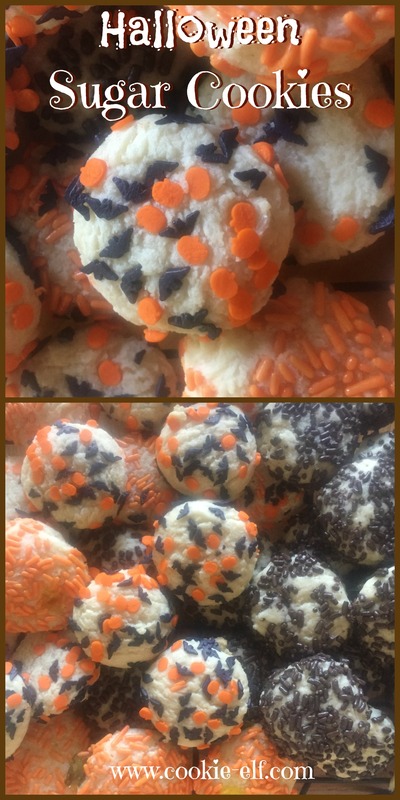 Yes, you can make Halloween Sugar Cookies from scratch with this recipe and avoid all kinds of mess and fuss. In fact, it’s just as easy (if not easier) than using a sugar cookie mix. That’s because there’s just 8 ingredients. And because this recipe is not fussy – you get soft sugar cookies every time. Instead, you scoop the dough and dip it into decorations or colored sugar. Preheat oven to 350ºF. Line baking sheets with silicone mats or parchment paper. In a medium bowl, combine all-purpose flour and baking soda. Set aside. In a separate bowl, using an electric mixer on medium speed, cream butter and sugar until light and fluffy, scraping the bowl continually, about 1-2 minutes. Add egg and vanilla extract, mixing until combined. Reduce speed to low. Gradually stir flour mixture into creamed mixture a bit at a time until well blended, scraping the bowl constantly, until well mixed, alternating with milk. Use a cookie scoop or spoon to form dough into scant 1-inch balls. Set balls, 2 or 3 at a time, in the bowl with decorations. Use a spoon to gently roll balls, making sure they are completely covered with decorations. Place balls in 2 inches apart on prepared baking sheets. Use the heel of your hand or the back of a spoon to gently press the balls into rounds. Bake cookies for 9-11 minutes or until they are set. Remove baking sheets from the oven. Coat the scooped cookies with vegetable spray before rolling them in decorations to allow decos to adhere better. If you prefer mounded sugar cookies rather than flatter, disc-shaped sugar cookie, then do not press the formed balls of dough into rounds before baking.